Nanoporous carbon is being used to create a new generation of supercapacitors that have greatly improved capacity and little effect on charging time. 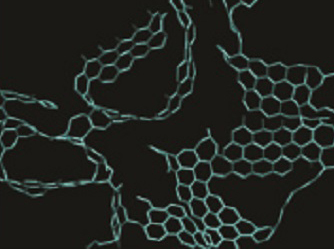 Researchers wonder why nanoporous carbon electrodes store more energy. Computer simulations will show how supercapacitors charge. Future supercapacitors could be a cost-effective, efficient method for water desalination. Supercapacitors are energy storage devices that can be charged and discharged in a few seconds. They are used instead of batteries in many applications where high power densities are required — like the stop/start systems in hybrid cars, and the Energy Recovery System used in Formula 1 racing. Although supercapacitors have been used commercially for over 50 years, only incremental performance advances have been made. However, a recent experimental study showed a new charge storage mechanism for nanoporous-carbon based supercapacitors, and now many simulations are attempting to reproduce and understand this mechanism. Nanoporous carbon electrodes, which have a larger ability to store a charge than do simpler geometries, might be expected to show poorer power performances because of the longer times taken by the ions to access the electrode interior. Simulations show this to not be the case, however. The dynamics aspects of this problem have not been addressed because this typically requires much longer trajectories to extract relevant quantities. Mathieu Salanne of the Pierre and Marie Curie University has been using PRACE resources to simulate the charging of supercapacitors in order to explain their fast charging times. Looking at the response time of a system of supercapacitor electrodes is computationally demanding. The system consists of two supercapacitor electrodes submerged in a liquid electrolyte made up of tens of thousands of atoms. Constant potential must be simulated inside the electrodes, so a special algorithm is used for the molecular simulations. Two types of simulations were carried out on up to 1,024 cores. The first type involved applying a finite potential difference, starting from 0V, between two nanoporous carbon based electrodes. The system was then charged, typically taking 10-20 nanoseconds for the nanometer-scale structures being used. “These simulations showed some regions responded very quickly whereas others were much slower,” says Salanne. The second series of simulations involved studying the systems at equilibrium, with the electrodes set at a fixed voltage. This allowed the researchers to determine the diffusion coefficients as well as characteristic times for various microscopic processes occurring in the liquid. The common belief that nanoporous systems perform poorly from the power density point of view therefore does not hold. Salanne’s results confirm that they are the most promising structures for the next generation of supercapacitors. Further experimentation in this area will involve tweaking the system in various ways, for example using different types of electrolyte. But as well as making excellent supercapacitors, nanoporous carbons have other potential uses. This article is republished with permission from the PRACE website.